The S&P 500 Price index returned 9.84% in 2016 – and that is the number you’ll see quoted most often in the press. However, a more extensive calculation including dividends reveals that the true 2016 S&P 500 return was roughly 12.25%. We know… if you’ve been following us for a while, we tend to beat the dividend reinvestment drum quite a bit. For the vast majority of investors (if not 100%) it’s the actual benchmark to check against. Although dividend timing, fees, slippage, taxes and other factors will cause individual returns to vary from the 12.25% number quoted, it’s a closer approximation than price returns. Assuming price returns are accurate is also assuming that investors in some way discard their dividends. Unless investors are using burning dividend checks to heat their houses, this can’t be accurate. We get these numbers from S&P Dow Jones Indices, the owner of the S&P 500. They estimate the effect of immediately reinvesting dividend payments of S&P 500 companies in the index. What would a lump sum purchase in a month have returned in some time period? Possibly assuming some taxes and fees as well as additional investment, what’s a good estimate of a period’s returns? Aggregating all time periods in the data set, what returns and variance have we seen in the past over those periods? A calculator which computes the Cyclically Adjusted Price to Earnings Ratio on the S&P for your choice of time period (default: ten years). Simply including some accounting for dividends was the difference between a ‘single digit’ and a 10+% return on the S&P 500. Make sure you use the right one when you’re benchmarking your own portfolios (and be sure to account for your own dividends!). Here are the exact numbers for the S&P 500 in 2016. We used the opening price on 1/4/2016 and the closing price on 12/30/2016 for these calculations. (Ed: As pointed out by Sagitta in the comments, another methodology would be to use the close price last year as the start point – in that case you’d be looking at ~ 11.96% gain). Where do you see the S&P 500 going in 2017? Will it do as well as in 2016? You’re absolutely right that most people (if not all) should be referencing or benchmarking off of the S&P500 Total Return Index as opposed to the Price index. I’m often amused when fund/asset managers reference the price index as their benchmark. It’s incredibly simple to beat it if you just receive the dividends! I think you made a minor error in your total return calculation though. You referenced the opening price on 01/01/16. The market was closed on that day. However, more importantly by using your methodology the change in total return (or price) index between close on 12/31/15 and open on 01/04/16 disappears because you attribute it to neither 2015 nor 2016. The total return index actually “started” 2016 at the close of 12/31/15, which was 3,821.60. Thus, the total return for 2016 is actually closer to ~11.96%. This is consistent with the methodology Standard and Poors uses here: http://us.spindices.com/indices/equity/sp-500. I always find your blog and data posts to be interesting so please keep up the great work! Thank you for the compliment and the correction! I’ve changed it to 1/4 above. As for the methodology, maybe I’m stuck in my ways but I started doing it as “price movements in a year” and have just carried forward. I’m sure you could attempt to assign some of the movement with before/after market trading and futures moves, but I it’s easier for me to label it as “if you only held in 2016” here’s what you’d have. Well, even that’s problematic since you can’t really sell a close… so I guess I can’t win either way. I’ll add a note with your comment – let’s be glad it’s just a rounding error. Happy new year, and thanks for being a reader – we’ve got big things planned in 2017, many of them data related! Thank you for explaining the difference. 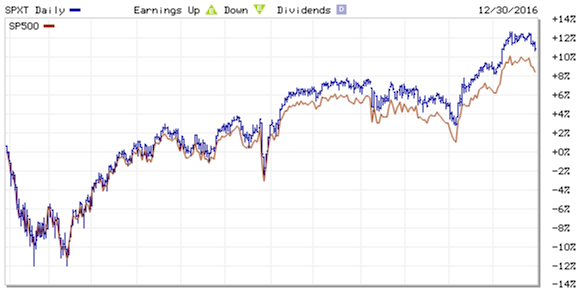 I assumed dividends reinvested was the difference, but when I log into personal capital, it looks like I crushed the S&P 500 by over 2 points, but then so did VFIAX, Vanguard’s Admiral fund that tracks the index. Love the calculator, by the way. I’ve linked to it several times. Cheers to double digit actual returns! Thank you for the kind words and the shares! This has, strangely, been one of my biggest battles the last few years. Setting dividend checks on fire just isn’t a realistic scenario (even when you have ‘FIRE’ in your name, right? It’s an acronym!). I’m also a fan of FIRE (Financial Independence, Retire Early), and those checks will help people achieve it more quickly. Hi – I’ve been trying to find this data everywhere so thanks very much. But a quick question. Why doesn’t the 12.25% or the 11.96% quoted here foot to the 11.152% I get as an output from the first calculator link you provided – S&P 500 Dividend Reinvestment Calculator. I used Dec 2015 as the starting month and Dec 2016 as the ending month. Thanks very much! Hi Raj, the calculator only has monthly resolution; if you can find daily data that’s what you should trust. December to December translates roughly to the return between the average closing price in Dec. 15 and Dec. 16. It doesn’t point to particular days.